The 2008 British Grand Prix (formally the Formula 1 Santander British Grand Prix) was a Formula One motor race held on 6 July 2008 at the Silverstone Circuit, Silverstone, England. It was the ninth race of the 2008 Formula One season. The 60-lap race was won by Lewis Hamilton for the McLaren team after starting from fourth position on the grid. Nick Heidfeld finished second in a BMW Sauber car, with Rubens Barrichello third in a Honda. Heikki Kovalainen started from pole position alongside Mark Webber and Kimi Räikkönen. Webber and Räikkönen were passed by Hamilton going into the first corner. Hamilton shadowed Kovalainen in the early stages of the race and passed him for the lead on lap five. Hamilton's win tied him for the lead of the Drivers' Championship, alongside Massa and Räikkönen. In the Constructors Championship, BMW reduced the lead of Ferrari to 14 points, with McLaren a further 10 behind. The Grand Prix was contested by 20 drivers, in ten teams of two. The teams, also known as "constructors", were Ferrari, McLaren-Mercedes, Renault, Honda, Force India-Ferrari, BMW Sauber, Toyota, Red Bull-Renault, Williams-Toyota and Toro Rosso-Ferrari. Before the race, Ferrari driver Felipe Massa led the Drivers' Championship with 48 points, BMW driver Robert Kubica trailed by two points, and Massa's teammate Kimi Räikkönen was third on 43 points. McLaren driver Lewis Hamilton was fourth with 38 points, ten points ahead of Kubica's teammate Nick Heidfeld. In the Constructors' Championship, Ferrari were leading with 91 points, BMW Sauber were second with 74 points, and McLaren were third with 58 points. Red Bull Renault were in fourth with 24 points, one point ahead of Toyota. Ferrari were the dominant team going into the race: their drivers had won five out of eight races, including one-two finishes in Bahrain, in Spain, and in the previous race in France. This had given them a strong lead in the Constructors' Championship. Kubica had performed consistently for BMW Sauber, only failing to score once, and had won his first ever Grand Prix four weeks ago in Canada. There's something about racing in your home country that affects you. The constant support of the crowd gives you a boost throughout the whole weekend. It's not something you experience anywhere else, but it does make you that bit more determined to succeed. Lewis Hamilton in the run-up to the British Grand Prix. Despite wins for Hamilton in Australia and in Monaco, he was facing pressure approaching his home Grand Prix; he had fallen from first to fourth in the Drivers' Championship after failing to score in the previous two races. He made a major error in the Canadian Grand Prix, running into the back of a stationary Raikkonen who was waiting at a red light in the pit lane, and forcing them both to retire. The stewards punished him with a ten-place grid penalty for the following race at the Circuit de Nevers Magny-Cours, severely damaging his chances, and he failed to score again after receiving a controversial drive-through penalty for overtaking Sebastian Vettel by missing a chicane. After the race he responded angrily to the punishment, and to the negative press coverage he had been receiving, saying: "There's nothing you can do that can distract me. You can keep on giving me penalties, whatever you want. I'll keep battling, and trying to come back with a result." However, he remained upbeat about his title chances and was "confident" going into the weekend. Three days of testing took place at the Silverstone circuit, over 25–27 June. Massa set the fastest time on the first day with a 1:20.188, three-tenths of a second faster than Kovalainen, but suffered a mechanical failure with 30 minutes to go; he was unable to escape the track, forcing the session to be red-flagged. Kovalainen improved on the second day to go fastest with a 1:20.015, in changeable conditions. Strong winds caused Giancarlo Fisichella to crash heavily at Becketts corner; he was uninjured, although medical checks meant he was unable to do further testing in the afternoon. On the final day, Hamilton set the quickest time with a 1:19.170, over six-tenths of a second clear of second-fastest Timo Glock. On Friday morning of the race weekend, it was announced by the FIA that the British Grand Prix would be leaving Silverstone from the 2010 season. Donington Park was awarded a ten-year contract to host the race, providing major renovations were completed. The British Racing Drivers' Club, owners of the Silverstone circuit, were disappointed with the announcement stating that development plans for the circuit had been progressing well. They were also critical of the timing of the announcement, being made on the weekend the circuit celebrated its 60th anniversary of hosting the British Grand Prix. On 3 July, Red Bull driver David Coulthard announced he was to retire at the end of the season, saying: "My decision was taken earlier this year and is based on a desire to stop while I am still competitive". He also explained the timing of the statement: "The decision to make this announcement at the British Grand Prix should be an obvious one for all to understand, as I have achieved two of my F1 victories at Silverstone and I am a member of the British Racing Drivers' Club, which hosts this event." Three practice sessions were held before the Sunday race: two on Friday, both lasting 90 minutes; and one on Saturday morning, lasting an hour. Massa was fastest in the first session, with a time of 1:19.575, despite a crash forcing him to miss the last 30 minutes. Fernando Alonso's Renault engine failed, leaving slippery oil on the racing line at Stowe corner. Massa approached the corner and lost control of his car, spinning off the circuit colliding with the barriers; he was unhurt, but his car was too damaged to continue. The session was stopped for 18 minutes to recover his car and cover the oil with cement dust. This left track conditions difficult, and nobody could beat Massa's time in the remainder of the session. It finished with Massa ahead of Kovalainen and Hamilton by less than one-tenth of a second; Raikkonen and Kubica were fourth- and fifth-fastest respectively. In the second session, Kovalainen was comfortably fastest, over half a second ahead of Red Bull driver Mark Webber, Hamilton, and Webber's teammate David Coulthard. Massa missed the first half of the session as his car was still being repaired, and was eighth-fastest. Both Toyota drivers had problems: Timo Glock stopped on track with a clutch problem; and Jarno Trulli crashed heavily at Stowe after a problem with his rear wing, although he was not hurt. Alonso set the fastest time in the final practice session, which took place in damp conditions following rain earlier in the morning. Early laps were attempted on extreme wet tyres, but the track dried throughout the session, prompting a move to intermediate wet tyres and, with around 20 minutes left, a further switch to dry tyres. Webber finished the session in second place, a quarter of a second slower than Alonso, and Kovalainen was third fastest ahead of Toro Rosso driver Sebastian Vettel. The qualifying session on Saturday afternoon was split into three parts. The first part lasted 20 minutes and eliminated the cars which finished the session 16th or lower. The second part lasted 15 minutes and eliminated cars which finished in positions 11 to 15. The final part of qualifying determined the order of the top ten drivers. Cars which competed in the final session of qualifying were not allowed to refuel before the race, and so they carried more fuel than in the previous sessions. We've been going really well all weekend after finding some good pace during testing last week. I've spent a lot of time racing in the UK so it feels great to have scored my first ever Formula One pole position at Silverstone. The car feels just fantastic at the moment; I was able to steadily improve throughout all three qualifying session and I'm confident our pace is going to be strong tomorrow. Heikki Kovalainen, following the third qualifying session. Kovalainen took his first ever Formula One pole position with a time of 1:21.049 in the final part of qualifying, half a second faster than anyone else. Webber would start alongside him on the front row, the Red Bull team's best qualifying result to date, and Räikkönen would start from third. Hamilton qualified fourth, opting for a more conservative approach to his second flying lap after he had pushed too hard on his first run and slid into the gravel. Nick Heidfeld was fifth quickest for BMW Sauber, ahead of Alonso, Alonso's teammate Nelson Piquet Jr., and Vettel. Championship leader Massa could only qualify ninth after a slow tyre change in the final session left him unable to record a second timed lap. Kubica did not set a time in the final session due to a technical problem with his car, meaning he started from tenth; the first race all season he had qualified behind teammate Heidfeld. Webber's teammate David Coulthard qualified eleventh for his final British Grand Prix, narrowly missing out on the last part of qualifying, and blamed problems with his car earlier in the day which had reduced his practice time. Sébastien Bourdais was thirteenth splitting the two Toyota cars of Glock and Trulli. Nakajima was the slowest of the cars to make the second part of qualifying, and would start the race fifteenth. Both Honda drivers failed to get past the first stage of qualifying, but were ahead of Rosberg in eighteenth, who was hampered by suspension problems. Adrian Sutil and Giancarlo Fisichella finished in the last two positions for Force India. Heikki Kovalainen leads McLaren teammate Lewis Hamilton in the early laps. There was persistent rain in the morning, leaving water on the track, although it had abated by the time the race began. The track temperature was 16 °C (61 °F) and the air temperature was 15 °C (59 °F). All drivers chose to start on the intermediate wet tyres. Rosberg started from the pit lane after a number of set-up changes. The front three drivers—Kovalainen, Webber and Räikkönen—all struggled for grip off the start, allowing Hamilton to edge ahead into the first corner. Kovalainen had the better line, however, and retook the lead after brushing tyres with Hamilton, who tucked in behind his teammate. A number of drivers struggled with the standing water on the first lap: Webber spun coming onto the Hangar straight, falling from fourth to last place; Massa spun going into Bridge, where he was passed by everyone except Webber; and Coulthard and Vettel ended up in a gravel trap after a collision, forcing them both to retire. Alonso showed good early pace, passing Piquet and Heidfeld on laps two and three respectively, and setting the fastest time of any driver on laps four and five. Massa spun for the second time during his third lap, dropping him to the back of the field. Hamilton shadowed Kovalainen closely for several laps, and passed him going into Stowe on lap five. Hamilton quickly extended his lead over Kovalainen, and there was already a six-second gap by the tenth lap when Kovalainen spun and was passed by Räikkönen. However, as the track dried, Räikkönen showed the better pace—particularly in the last two sectors—and the gap was under a second by the time they both pitted on lap 21. Rubens Barrichello took Honda's first podium finish since 2006. McLaren gave Hamilton a new set of intermediate wet tyres; in contrast, Ferrari gambled that the track would continue to dry and refuelled Räikkönen without changing his tyres. Despite his pit stop being longer by half a second, Hamilton exited just in front of Räikkönen (Heidfeld briefly took the lead until his pitstop the following lap). McLaren were vindicated in their decision almost immediately: the rain returned and Räikkönen was unable to find grip, falling back from Hamilton by up to eight seconds a lap. By lap 27, Kovalainen and Heidfeld had caught the struggling Räikkönen, and as Kovalainen overtook Räikkönen, Heidfeld passed them both to take second place. On the same lap, Fisichella spun out and retired; his Force India teammate Sutil had already retired after a spin on lap 11. After being passed by Kubica and Piquet, Räikkönen finally pitted for fresh tyres on lap 30, dropping him to eleventh place. Kubica overtook Kovalainen for third place, shortly before Kovalainen pitted for the second time. Despite the rain getting heavier he opted for a new set of intermediate tyres. Both Kubica and Glock left the track and rejoined; however Glock lost a place to his teammate Trulli. On lap 37, both Hondas elected to change onto the extreme wet-weather tyres, Button queuing behind his teammate in the pitlane while waiting to be serviced. Nelson Piquet Jr. spun off the track and beached his car in a gravel trap, ending his race, while in separate incidents within a few moments of each other Hamilton, Kubica, and Massa all lost control of their cars and travelled over the grass before rejoining the track, without any damage. Räikkönen also spun off on the same lap, again rejoining the circuit without damaging the car. Hamilton, leading the race by around 30 seconds, made a pitstop to change tyres and take on fuel on lap 38, opting for a new set of the intermediate wet-weather tyres, as the weather forecast predicted the rain would ease. Second placed driver Heidfeld pitted the following lap, opting for the same tyre choice as Hamilton. The gap between the two leaders at this point was 36 seconds. Kimi Räikkönen spun off in his Ferrari for the second time in as many laps, again though he avoided contact with the barriers and was able to rejoin the track. Lewis Hamilton won the race by over a minute from second-place Nick Heidfeld. With 20 laps of the race remaining, Rubens Barrichello on the extreme wet weather tyres was about nine seconds a lap quicker than the majority of the field and quickly moved his way up to fourth place by passing Kovalainen and Alonso. Robert Kubica retired from the race after losing control of his car and ending up beached in a gravel trap. Nico Rosberg ran into the back of eighth placed Timo Glock as he attempted to overtake. The collision damaged Rosberg's front wing, and he was forced to make a pit-stop to change it. By now the rain had stopped, but the track surface was still wet. Barichelllo caught and passed Trulli to move up to third position; however a refuelling problem at his earlier pit stop meant that he would need to stop again. Before that however, he passed Heidfeld for second position and then built up a twenty-second gap over him before making his pit stop on lap 47, opting to change to the intermediate wet weather tyres. He rejoined in third place, behind Heidfeld. Kovalainen passed Alonso for fifth place at the Bridge corner. Trulli then pitted, promoting Kovalainen to fourth. Felipe Massa spun on the exit of Woodcote, managing to recover without any damage. A few moments later Mark Webber made a similar error at the same location. The following lap saw a spin from Kovalainen, which allowed Alonso and Räikkönen to get past while he recovered to the circuit. Massa, the last car on the road still running in 13th position, spun for the fifth time during the race. He continued without any damage, and made a pit stop the following lap for new tyres and fuel. The final few laps saw a battle for fourth place, as first Räikkönen and then Kovalainen passed Alonso. Hamilton crossed the finish line on lap 60 to win the Grand Prix by 68 seconds from Nick Heidfeld in second. The margin of victory was the largest since the 1995 Australian Grand Prix. Rubens Barrichello finished in third position for Honda's best finish of the 2008 season. Kimi Räikkönen finished in fourth ahead of Kovalainen and Alonso. Räikkönen had also set the fastest lap in the early stages of the race, the sixth consecutive race in which he had done so. Jarno Trulli finished in seventh position, and Kazuki Nakajima finished the race in eighth. It is definitely and by far the best victory I've ever had. It was one of the toughest races I have ever done. I was thinking out there if I win it, it will be the best race I have ever done, not just because of the home crowd. On the last laps I could see the crowd starting standing up, and I was praying, praying 'just finish'. You can imagine the emotions going on inside and I wanted to get it around. The top three finishers appeared on the podium to receive trophies and took part in the subsequent press conference. Hamilton commented on the difficult conditions, comparing them to the 2007 Japanese Grand Prix, and the limited visibility: "I couldn't see through my visor, so through turn one and two I had to clean visor, put it up and back down again. I had to do that on every lap especially when it was rained. I couldn't see anything. It was so extreme, so tough, a real mental challenge." He also thanked the fans for their support. Heidfeld said it was vital to make the correct tyre decisions, and also spoke about the challenging weather: "The most difficult moments in the race were when cars were overtaking me who had been lapped, but were just on better tyres for the conditions at that time. There was so much water and I couldn't see where it was lying." Barrichello, who took his first podium since the 2005 United States Grand Prix, described it as a "perfect race". He said that after he switched to extreme wet tyres, he was "passing people from inside to outside, it was just magic". After the race, Hamilton tied with Massa and Räikkönen for the lead of the Drivers' Championship, on 48 points. Kubica dropped two places, remaining two points behind the championship leaders. Heidfeld remained fifth. In the Constructors' Championship, BMW reduced Ferrari's lead to 14 points. McLaren made up six points on BMW, although they were still 10 points behind. ^ "2008 Formula 1 Santander British Grand Prix". Formula1.com. Formula One Management. 6 July 2008. Archived from the original on 17 October 2010. Retrieved 4 January 2011. ^ "Grand Prix of Great Britain". Fédération Internationale de l'Automobile. 6 July 2008. Archived from the original on 12 November 2010. Retrieved 4 January 2011. ^ a b "Qualifying classification". Fédération Internationale de l'Automobile. 6 July 2008. Archived from the original on 22 June 2011. Retrieved 4 January 2011. ^ a b c d "Race classification". Fédération Internationale de l'Automobile. 6 July 2008. Archived from the original on 22 June 2011. Retrieved 4 January 2011. 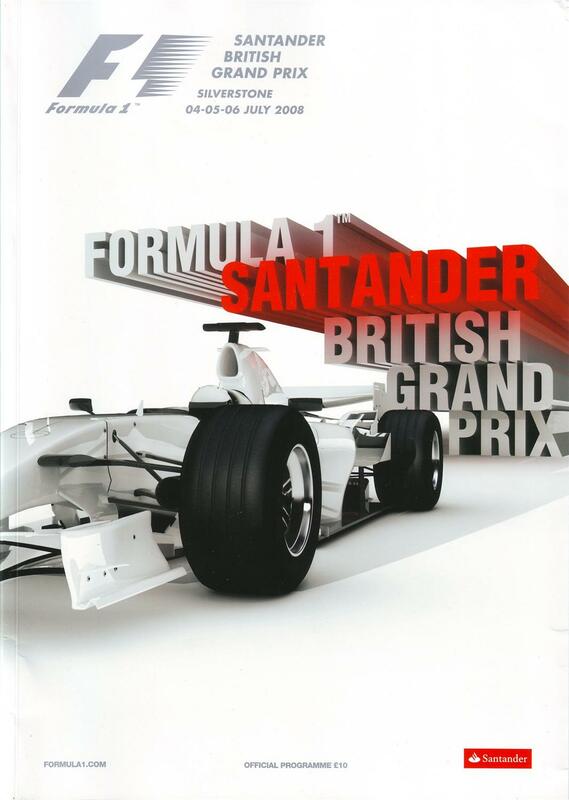 ^ Formula 1 Santander British Grand Prix Official Program. 2008. Retrieved 11 September 2010. ^ a b "Championship Classification". Fédération Internationale de l'Automobile. Archived from the original on 16 December 2010. Retrieved 4 January 2011. ^ "Bahrain GP – Sunday – Race Report: Massa on his own". GrandPrix.com. Inside F1, Inc. 6 April 2008. Archived from the original on 26 February 2009. Retrieved 4 January 2011. ^ "Spanish GP – Sunday – Race Report: Kimi all the way (well nearly)". GrandPrix.com. Inside F1, Inc. 27 May 2008. Archived from the original on 8 May 2009. Retrieved 4 January 2011. ^ a b "French GP – Sunday - Race Report: Some very good red". GrandPrix.com. Inside F1, Inc. 22 June 2008. Retrieved 4 January 2011. ^ a b "Canadian GP – Sunday - Race Report: Bimmer Fest". GrandPrix.com. Inside F1, Inc. 8 June 2008. Retrieved 4 January 2011. ^ "Australian GP – Sunday - Race Report: Ron's silver lining". GrandPrix.com. Inside F1, Inc. 16 March 2008. Retrieved 4 January 2011. ^ "Monaco GP – Sunday - Race Report: In the wheeltracks of giants". GrandPrix.com. Inside F1, Inc. 25 May 2008. Archived from the original on 29 January 2009. Retrieved 4 January 2011. ^ Benson, Andrew (23 June 2008). "Hamilton is battling the wrong demons". BBC Sport. Retrieved 4 January 2011. ^ Giles Mole and agencies (4 July 2008). "Donington to host British Grand Prix from 2010". The Daily Telegraph. Retrieved 4 January 2011. ^ a b Benson, Andrew (3 July 2008). "Coulthard announces F1 retirement". BBC Sport. Retrieved 5 January 2011. ^ a b "2008 Formula One Sporting Regulations" (PDF). Fédération Internationale de l'Automobile. 19 May 2008. Retrieved 4 January 2011. ^ a b c d e f Times Online and agencies (6 July 2008). "Lewis Hamilton wins the British Grand Prix". The Times. Retrieved 7 January 2011. ^ a b c d Creighton, Geoff; Hughes, Emelyn (6 July 2008). "As it happened: Raceday at Silverstone". autosport.com. Haymarket Publications. Retrieved 24 June 2014. ^ a b c d e f g "Race Facts". Fédération Internationale de l'Automobile. 6 July 2008. Archived from the original on 7 January 2010. Retrieved 7 January 2011. ^ a b c d Mike Norrish and agencies (6 July 2008). "Lewis Hamilton wins British Grand Prix". The Daily Telegraph. Retrieved 6 January 2011. ^ a b c d "British GP - Sunday - Race Report: Lewis shows his class". Grandprix.com. Inside F1, Inc. 6 July 2008. Archived from the original on 1 April 2016. Retrieved 7 January 2011. ^ Andrew Benson (6 July 2008). "British Grand Prix". BBC Sport. Archived from the original on 2 December 2010. Retrieved 7 January 2011. ^ a b Lyon, Sam (6 July 2008). "British Grand Prix: As it happened". BBC Sport. BBC. Retrieved 24 June 2014. ^ a b Alan Henry (December 2008). Autocourse 2008-09. CMG Publishing. pp. 180–181. ISBN 1-905334-31-1. ^ a b "Britain 2008 - Championship • STATS F1". www.statsf1.com. Retrieved 14 March 2019. 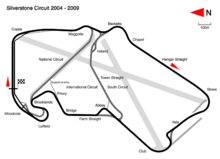 Wikimedia Commons has media related to 2008 British Grand Prix.